The DragonFly redefines the meaning of a high performance boat that will take you hunting, fishing or just exploring where no other boat can go. The DragonFly is a smooth riding, rough duty boat that handles like a personal watercraft, yet gives you true versatility. 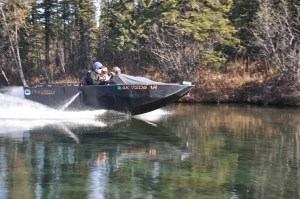 Built to carry two men and a moose it can run in extremely shallow water, allowing you to get through areas that you would not want to attempt with a larger boat. It can travel in inches of water and can jump gravel bars, logs, and even rocks. The hull provides a quiet, smooth ride and will not dent like other materials; allowing you to go places with this thermoplastic boat that you cannot with an aluminum, fiberglass or wood hull. Powered by a 130 to 250+ horsepower supercharged four-stroke engine, the DragonFly reaches speeds over 45mph in the blink of an eye. It will take you through shallow water to your favorite fishing or hunting spot with a smile on your face. You may even forget about fishing or hunting so you can spend more time boating! Whether you are setting up base camp for a back woods hunt, or taking friends out to the cabin or your favorite fishing area, the Kobuk is designed to be a one trip boat. The Kobuk is a rough duty boat (RDB). The performance of its welded plastic hull has previously been only a dream of boat owners. Rocky shore lines, stumps, logs, or ice bergs will not dent the Kobuk. Plastic is quieter on the water, both while under way and at rest, and it is non-corrosive. The Kobuk has an 8-foot beam and is self-bailing, so it can handle the rugged waters of Alaska without fear of capsizing. Configurations are available to meet your needs, including models with a full windshield, open or closed bow, center or side console, and various cabin options. It can also be fitted for search and rescue operations, or other special purposes. 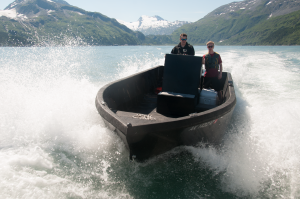 When other boats fail along Alaska’s waterways the Kobuk will still be running strong!